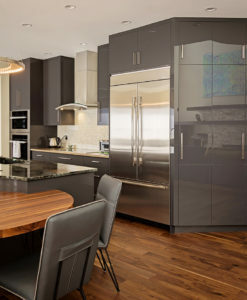 At Ekko Custom Cabinetry & Design, we are constantly monitoring current design trends for great new ideas that we can use to enhance our customer’s vision and provide a space that will stand the test of timeless good taste. 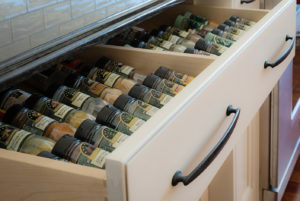 With this in mind, we just reviewed a great article on the top kitchen cabinet styles, colours & trends for 2019, in the Jan. 16, 2019 edition of “Houzz” written by Erin Carlyle on Jan. 16, 2019. Houzz has accumulated data throughout 2018 and surveyed more than 1337 renovating homeowners as part of Houzz’s “2019 U.S. Kitchen Trends Study”. Here is what they’ve found to be the “Top of the Kitchen Wish List in 2018”. 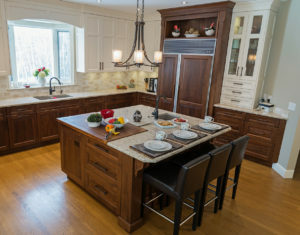 Some of the most popular choices in 2018 included transitional styles, flat panel shaker-style designs, custom cabinetry, (again) white cabinets (with woods gaining in popularity), Pantries and Islands with wood floors and accent coloured cabinets. For the purposes of this blog, we will only relate to cabinetry and countertops due to their relative influence on designs and layouts. 1.) 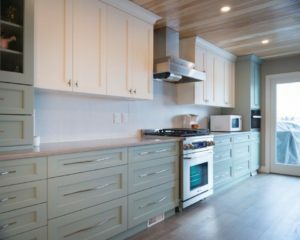 “Transitional” is Still the Most Popular Kitchen Style but other design trends are gaining as 82% of homeowners who are renovating are changing styles as part of the project. “Contemporary” has again come in second with “Farmhouse” coming in as a close third. “Traditional”, “Modern” and “Craftsman” selections round out the style selections. 2.) “Shaker” (57%) and other recessed panel door designs continue to be the top choice for cabinets. “Flat-panel” (19%) contemporary or modern designs are gaining in market share, particularly with the younger participants in the study. “Raised-panel” (16%) traditional designs round out the door design selection choices. 3.) Two in 5 homeowners (41%) remodeling their kitchens are choosing custom cabinets, while 33% are choosing semicustom cabinets. Only 12% are choosing stock cabinets while the remaining 10% are making ready-to-assemble choices. 4.) Colour preferences seem to be strongly affected by door style selections. White (or permeations of the white spectrum) continue to be the #1 (43%) choice for renovating. Stained woods (25%) and Gray-tones (11%) round out the most selected colour choices. We have noticed a strong movement to unique accent colours in painted or stained finishes - particularly in selections where the primary design incorporates more traditional painted finishes. These selections offer a much more personal design note to decorate to. As well, we’ve noticed a much wider array of colour options available in the contemporary or modern door selections with a strong influence from European designers and manufacturers. 5.) 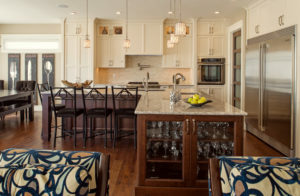 Pantry Cabinets (40%) and Islands (38%) have become the most popular built-in features. The reasons are widely varied from practical storage, to practical additional and accessible work space, to a sensational design and layout feature. 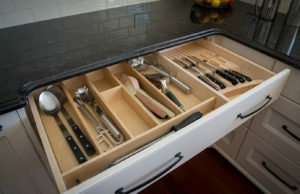 Quick access to efficient storage is a welcome addition to any working kitchen. “Breakfast or Lunch” bars have been requested 19% of the time. These features can provide additional work space or invite the family and friends in for visiting, homework help or “catch-up” time while meals are being prepared. 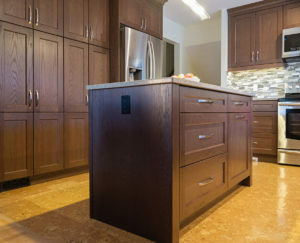 At Ekko Custom Cabinetry and Design, we strive to exceed your expectations. Whatever the reason for your renovation, consider this as an investment in your life and home – do it right the first time – you’ll be rewarded in your quality of life and the ultimate boost in your real estate value. 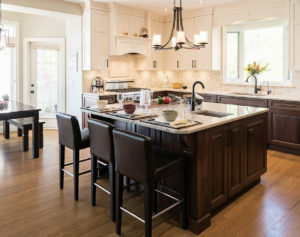 Our custom kitchen and bath design staff can help you through a process that will give you the space you have dreamed of ……. and deserve.